The Mass Observation Project was launched in 1981, with the aim of reviving the early Mass Observation organisation idea of a national writing panel. Since it began, almost 4,500 people have volunteered to write for the Project. Many of these writers have been corresponding over several years, making the Project rich in qualitative longitudinal material. There are currently around 450 volunteer participants on the Mass Observation writing Panel. These writers (often known as “Observers”) respond to “Directives”, or open-ended questionnaire, sent to them by post or email three times a year. The Directives contain two or three broad themes which cover both very personal issues and wider political and social issues and events. Some examples of Directive themes include: The Countryside (Winter 2013); The Big Society (Spring 2012); Age and care (Summer 2011); What makes you happy? (Winter 2013). The Project collaborates with academics and non-commercial organisations across disciplines to produce Directives. Visit our commissioning page for further information on how to collaborate with us. When Observers join the Project they are issued with a code which they use on their writing to protect their identity and give them anonymity. This means they are able to write openly and candidly. As a result, the Project solicits in-depth accounts (both opinion and experience) of everyday life: stories, memoirs, lists, letters, diagrams, drawings, maps, diaries, photographs, press cuttings, confessions, reports on people, places and events, across a wide variety of topics. The responses to the Directives can be accessed at The Keep. You can browse the collection on The Keep catalogue or consult a list of all the Directives in date order. Details about visiting The Keep can be found here. Copies of the Directive questions sent to the Mass Observers can be downloaded here. You can also access information about the Mass Observation Project Panel on this database, which contains information about the biographical/demographic characteristics and writing behaviours of individual Mass Observation Project writers. In 2012 the University of Sussex received Jisc funding for a project called Observing the 1980s. 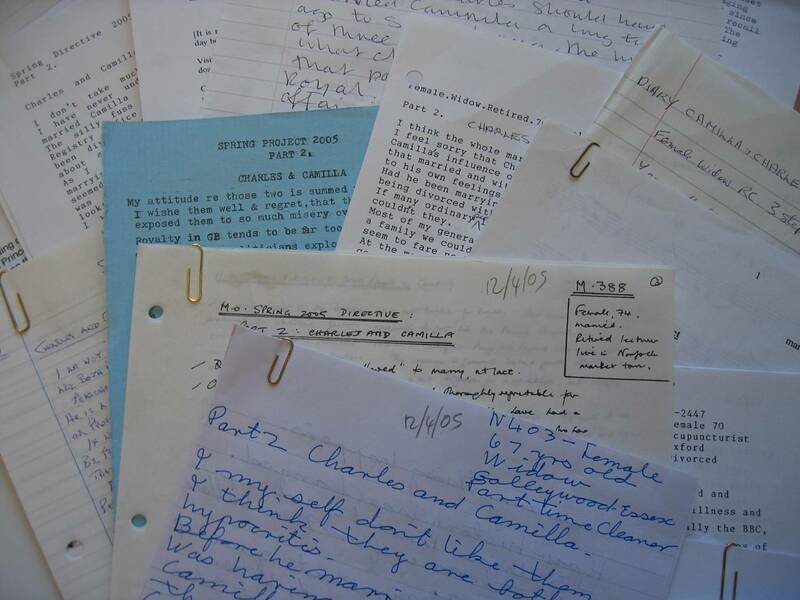 As part of the project, we digitised selected documents from the Mass Observation Project and the British Library’s Oral History collections alongside 1980s documents and ephemera from the University of Sussex Library. Responses to the Mass Observation Project Summer 2012 Directive on the Diamond Jubilee bank holiday weekend can be accessed online through the UK Web Archive at the British Library. This blog was created to capture observations from Mass Observation panel members about HRH's Diamond Jubilee in June 2012.